Posted on June 4, 2013 by Bill C.
The full photo show of the Grade 4 QR Code and Mapping project for the Old Stones Society is here ! Posted on May 21, 2013 by Bill C.
It turns out they were right and I was wrong—very wrong. My mistake is even stated on the descriptive panel at the entrance to the cemetery. It says “The earliest known burial in the Free Will Baptist Cemetery is that of Edward Nickerson (#28) who died 19 May 1840; however, it is probable his remains were moved to this Cemetery after the Church was built about 1852. Well, as the students discovered, Edward died in 1890 and he definitely was not the first burial in the cemetery. So who was the first person buried in the Free Will Baptist Cemetery? The truth is, “we don’t know.” Thanks to people like the students who were with us this morning we are learning new things every day. Here’s what we know today, but we may learn something new tomorrow. Possibly the first burial in the cemetery was that of Charles Edward Perry, who died 29 February 1852 at the age of about 4 months. He was born 23 October 1851. 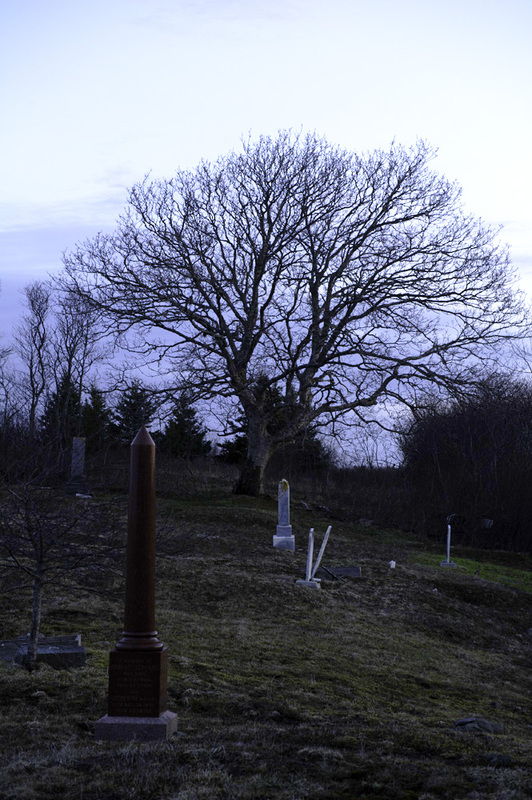 You won’t find a grave marker for him because on 5 Nov 1900 his remains and maybe his grave marker were taken from the Free Will Baptist Cemetery and placed in the Port Maitland-Beaver River Cemetery which at that time was known to many people as Island Cemetery. The same thing happened to a 6 month old child, Anna Maria Perry, who died 16 June 1853. So whose was the first burial that still may be seen in the cemetery today? We believe there are two possibilities. The first is Isaac K Cann who died 29 August 1855 at the age of 24. He wasn’t married. The second is Jacob Perry who died 3 days later on 1 September 1855 at the age of 28. He was married and his wife Caroline died 35 years later. She is buried next to him. Thank you students of Port Maitland school for helping us correct our information. Please come back again because there are probably more mistakes to be discovered. Perhaps you’ll help us find an even earlier burial. 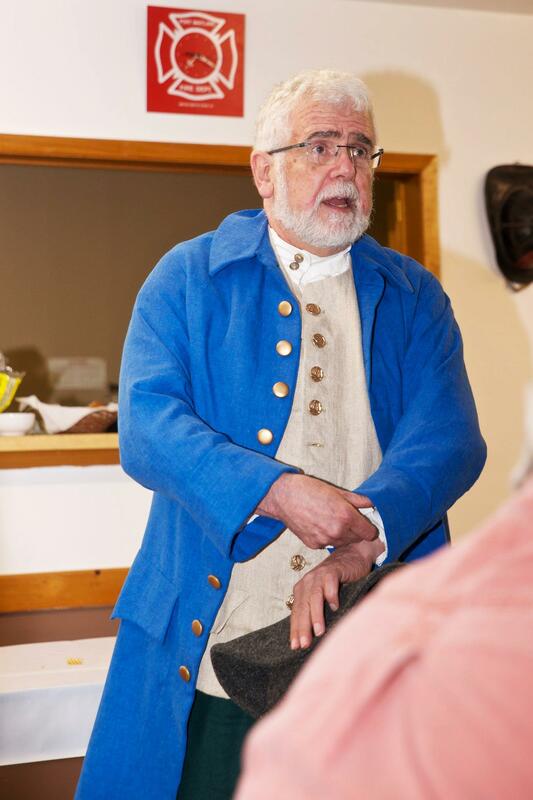 Posted on April 16, 2013 by Bill C.
Here is the slide show that was shown on April 15, 2013 at the AGM of Old Stones. The slide show will open in a new browser, and you can click on your arrow keys or hover your mouse at the bottom to go through the slides. 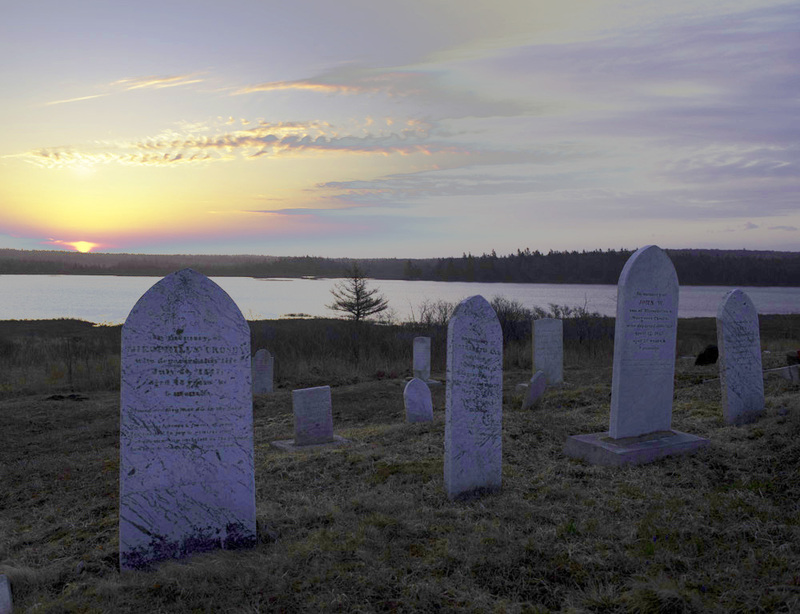 The show starts with some of the early clearing of the cemeteries, goes through some of the grave marker restoration, shows many of the people involved and concludes with a look at the Life Members of the Society, including our newest Life member – Ann Sorensen – who you will see with alders over her head when the clearing began. A wonderful look back at what we’ve accomplished over the last number of years – and here’s hoping for more to come in the future as we continue to research and develop our understanding of the importance of the individuals in the cemeteries, all while we still maintain and restore the grounds. All like-minded people are encouraged to join the Society – check out the membership link , it’s only $5 and it goes toward a most deserving effort! 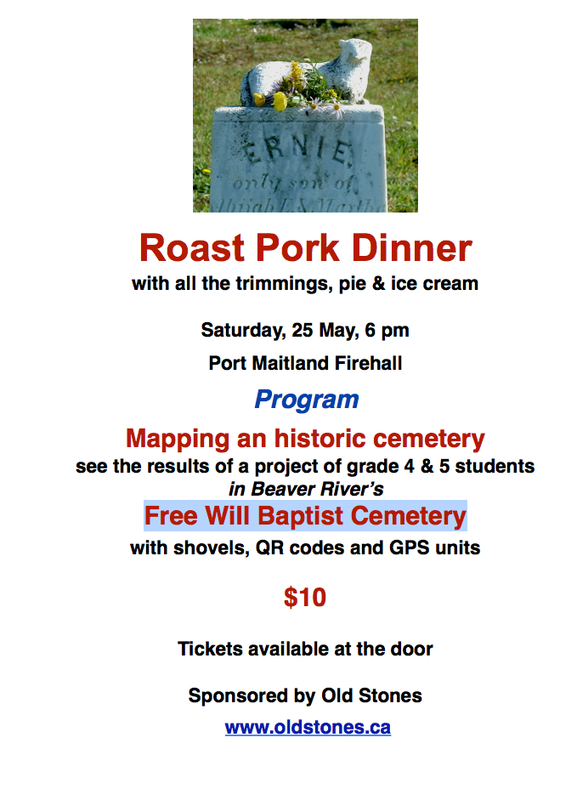 Posted on April 2, 2013 by Bill C.
Posted on August 9, 2012 by Bill C.
Posted on July 4, 2012 by Bill C.
Posted on May 27, 2012 by Bill C.
On Saturday evening the OBRPMCPS held its annual Potluck and Community Quiz event at the Port Maitland Fire Hall. A good crowd enjoyed marvellous food and refreshments, checked out the “pay what you wish” book table and enjoyed the lovely atmosphere of formal table cloths and flowers – and then were treated to a lively community history quiz hosted by Squire John Crawley (pictured here) as portrayed by society President, Wilfred Allan. The event is a fund raiser for the OBRPMCPS, but it also is just a very fun community event and get together. Participants had a friendly contest to see who could come up with the answers to questions like “Which community (given four choices) is technically an island…”. Team Brown won the team category by default, but lively discussion and factual information were the order of the day during the quiz. The Society wishes to thank the organizing committee, headed by Nancy Curry and her crew for the great time! 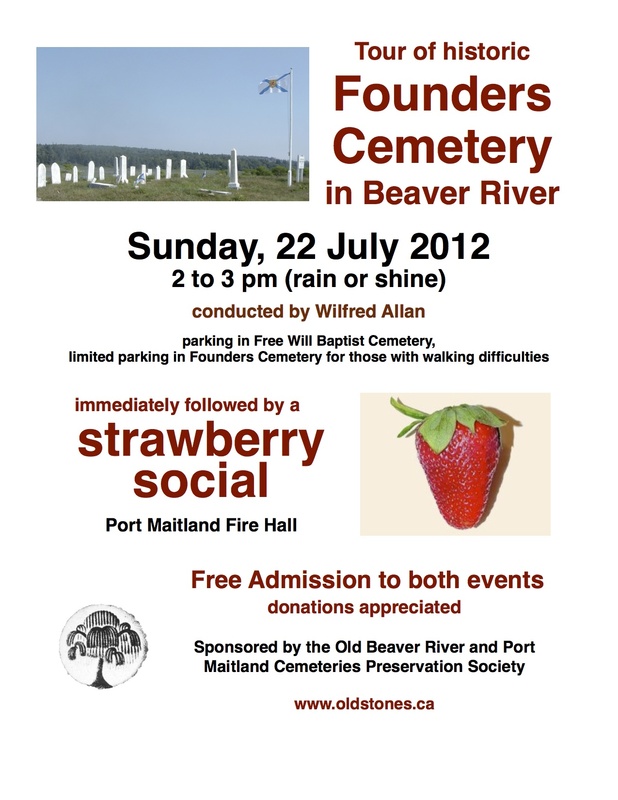 The Society’s next event is the Founder’s cemetery tour and Strawberry Social to be held on July 22nd ! 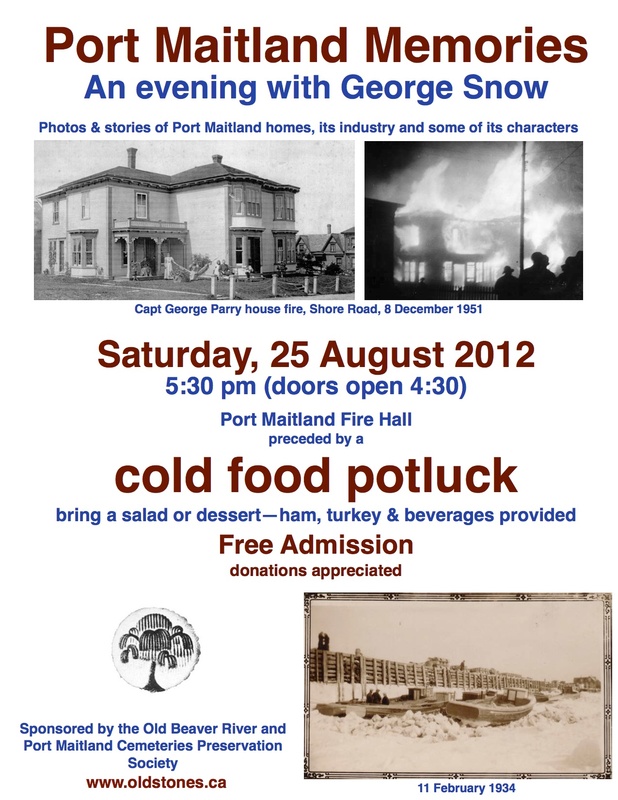 Posted on May 10, 2012 by Bill C.
Posted on September 23, 2011 by Bill C.
The Old Beaver River and Port Maitland Cemeteries Preservation Society will be having a General Meeting on November 21, 2011 at the Port Maitland Fire Hall at 7 p.m. The General Meeting is open to all members, and new members may join at the meeting – All interested people are welcome ! One of the items that will be talked about will be the Society’s new website and logo. The executive has looked at two possible logos to use for the Society, and would like to hear from people either by e-mail (send messages to oldstones@billcurry.ca ) or in person at the meeting. The two logos being considered are stylized versions of a Willow tree, a symbol which is fairly unique, but also widely used in our cemeteries. The images are a representation of those symbols such as are found on Abial Crosby’s stone in the Founder’s Cemetery.